Memorial Hospital in Central Bakersfield was on lockdown for almost three hours, while police investigated a possible active shooter. 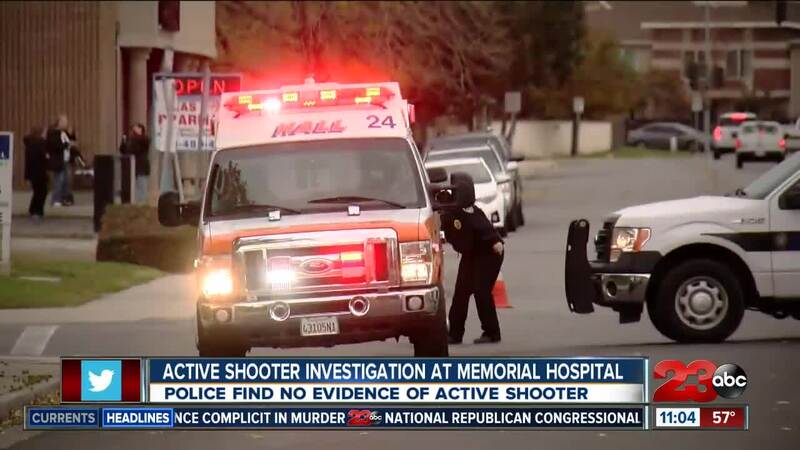 BAKERSFIELD, Calif. — Officers with the Bakersfield Police Department responded to a report of an active shooter at Memorial Hospital just after 1:36 p.m. on Tuesday, December 4. Within two minutes of the call reported, units secured the area and found that there was no evidence of a shooting and no injuries were reported. All patients were accounted for and the hospital lockdown was lifted by 4:15 p.m.
Investigators learned that the hospital operator internally disseminated the emergency alert after receiving a phone call from an unidentified male subject who reported an active shooter within the facility. According to police, it was determined that the phone call was made within the hospital to which the hospital immediately called and reported the situation to BPD. When officers arrived, another reporting party called in to BPD to report possible gunshots heard in the parking lot north of the emergency room. Officers were unable to locate any evidence of a shooting inside or outside of the hospital and no there reports of shots fired were reported. Several local agencies responded to the area to assist with the investigation. Those agencies included CHP, Bakersfield Fire, Hall Ambulance, CHP and Kern County Emergency Medical Services. This investigation is ongoing, anyone with information is asked to call BPD at (661) 327-7111. Dignity Health also released a statement regarding the reports of an active shooter at Memorial Hospital stating that it was determined by law enforcement that there was no threat or active shooter and that the hospital has resumed normal operations.